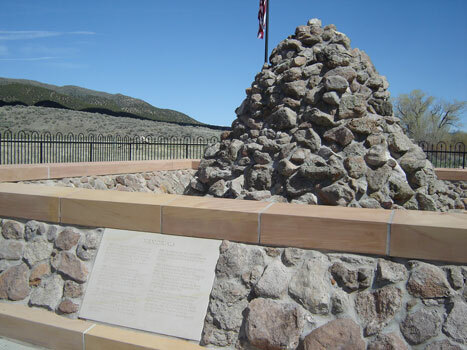 Recently, several of us at MRM took a “field trip” down to the site of the Mountain Meadows Massacre. I have been to this area probably about a dozen times since my wife and I first visited in 1977. Back then a small sign marked the dirt road leading to the hill that overlooks both the Fancher/Baker campsite and the massacre site located to its north. Thirty years ago few people had a clue as to what happened there on September 11, 1857. Many are unaware that until the Oklahoma bombing in 1995, more Americans died in the Mountain Meadows Massacre than in any other terrorist act on American soil. Even after our modern 9/11 it remains number three in American deaths. The exact number is not known, but it is generally believed that 120 men, women, and children heading to California were killed by Paiute Indians and local Mormons. Most of the times I have visited the Mountain Meadows you can hear nothing but the wind. However, this time the silence was broken by people talking and children playing around the rock cairn that marks the graves of several massacre victims. When the film September Dawn opens, now scheduled for August 24th, I am sure its popularity will grow even more. Already the LDS Church has denounced the film as inaccurate and no doubt many of the Mormon faithful will echo that sentiment without viewing it themselves. The fact that it has been given an R rating will automatically prevent many Mormons from watching it. A word of caution to thinking LDS before they join in the chorus with their leaders. Keep in mind that most of what we know about this brutal crime comes to us by the men who committed the crime. “I have always believed, since that day, that General George A. Smith was then visiting Southern Utah to prepare the people for the work of exterminating Captain Fancher’s train of emigrants, and I now believe that he was sent for that purpose by the direct command of Brigham Young” (Confessions of John D. Lee , 225). I can’t even begin to imagine these men acting in such a manner without some guarantee of protection from their leaders. The fact is, Brigham Young did protect the perpetrators. For twenty years all involved kept an oath of secrecy, and when the truth became known, only one man among many, John D. Lee, was executed for the crime. Apparently the LDS Church did not think Lee’s participation was too awfully bad. Will Bagley, author of Blood of the Prophets – Brigham Young and the Massacre at Mountain Meadows, states that on April 20, 1961 “the First Presidency and the Quorum of the Twelve authorized the restoration of Lee’s membership and temple blessings.” Bagley writes that on May 9, 1961, “Apostle Ezra Taft Benson officiated in the endowment and sealing ceremonies at the Salt Lake Temple” (361). It is customary for the LDS Church to give a blanket condemnation of anything that criticizes its history or doctrine. However, given its history of hiding documents, can we really trust such denials? If you want to know more about this American tragedy, I strongly recommend Bagley’s book. Just an FYI, rumor has it that the release of this movie has been postponed until August. The official movie website, http://www.septemberdawn.net/ , says August 24. Moderator’s note: Thanks — the new release date has been noted in the post. I am in St. George at the moment. I slept for a few hours in my car and caught the sunrise this morning at Mountain Meadows. First time experience. Four vanloads of adults from Arkansas showed up around 7:45 a.m. I find this to be really sad: Already the LDS Church has denounced the film as inaccurate and no doubt many of the Mormon faithful will echo that sentiment without viewing it themselves. The fact that it has been given an R rating will automatically prevent many Mormons from watching it. No need to watch it, if it doesn’t carry the seal of approval from Salt Lake, it must be false, anti-mormon propaganda. The film has been reviewed by several groups at advanced screenings. One non-Mormon reviewer has echoed the idea that the film is inaccurate in a review at the Main Street Plaza blog. Also actor Jon Voight has been talking about the film in Media interviews and has acknowledged that the film does not present the fact that Brigham Young expressly ordered that the emigrant wagon train be left unmolested. The local militia acted based on decisions by local leaders before waiting to hear whether Brigham Young approved of their plan. Instead, the film advertizes itself (in its trailer) as exposing Brigham Young as the figure who ordered it. None of this excuses what happened that day. But it is unfair to criticize the Church for stating that the film is inaccurate when, in fact, it is inaccurate. By contrast, the Church has recently published a brief summary of what happened on its website in a pre-release of an Ensign article that will be published in September 2007. In case any are interested, I have now posted about September Dawn and background at Mormon Mentality in a post that collects sources about the massacre and the movie. Moderator’s note: Comments are allowed and encouraged on Mormon Coffee for the purpose of sharing personal opinions and insights about LDS topics while fostering ongoing conversations. Comments which merely link to other websites and blogs do not fulfill this purpose; therefore, such comments will not be approved for posting or will be removed at the moderator’s discretion. Thanks for your future compliance. Fair enough, mod. But The Mormon Wasp has a series of posts up showing the known inaccuracies appearing in just the trailer of the film. If the trailer is full of inaccuracies, it does not speak well for the film itself. I tried to go to the mormon wasp but was told it is for invited readers only. I’d like to read the posts about inaccuracies but I will not give my information to invite more MM to my home. Does anyone have any idea why the release date for September Dawn keeps getting pushed out? One of the LDS elders that I asked mentioned that, in addition to the movie being highly inaccurate, LDS opposition was causing delays in the movie’s release. I have no idea why it is being pushed back, but I don’t imagine that anyone thinks this film was ever meant to be an Academy Award contender. I have to chuckle over the complaint of “innacuracies.” Its a drama folks, not a documentary. Just about all we know about the massacre has been told by the perpetrators, and until the LDS Church shows some real integrity and opens their archives to any and all qualified scholars, I am sure there will always be a level of doubt regarding what actually happened. I do know that all who were involved in the upcoming LDS book had to make an oath not to discuss it. Hmm, wouldn’t be the first time an oath of secrecy was invoked regarding the events of September 11, 1857. I do have one question, “How high up the priesthood chain of command do over 50 faithful Mormon men have to go to kill 120 men, women, and children?” I think I understand the concept of LDS priesthood authority enough to know the answer to that is not a Stake President or Bishop. When I read of “inaccuracies”, I think of that line from the movie 1776, where Ben Franklin says something to the effect that “treason is an excuse made up by the winners to hang the losers”. But since the movie seems to be taking on the trappings of “anti-Mormon propaganda”, as Arthur mentioned, I was wondering if there were some behind-the-scenes actions deliberately causing the delay, or if it were just post-production hiccups. In any case, it was disappointing to see the release date changed. My wife was willing and eager to put aside her grad school work to go see it, and that is a rare event indeed! Bill, have you heard if the upcoming book “Massacre at Mountain Meadows” is anywhere close to being printed? Last I heard, Oxford had the manuscript, but has given no indication as to when or if the book will be published. Bill, pretty funny. It invites the question of how high up the ranks of Evangelicals and televangelists does one have to go to be a BTK killer. In the face of evidence that Brigham Young did not order the massacre and sent a letter ordering the militia to let the wagon train pass unmolested, it is unclear what purpose the producers of the movie would have in eliminating mention of such historical fact. David M., at the Mormon History Association conference held in Salt Lake City last month, it was stated that “Tragedy at Mountain Meadows” is planned to be released near the end of this year. Really, it is a drama and Mormons are easy targets. The “icky” factor and all that. So, why not? There is a post up at http://www.lds.org that gives an overview of the findings that will be published in the book. I would suggest that you go check it out if you are interested. I am deeply curious regarding both you knowledge of LDS hierarchy and, particularly, secret oaths regarding books about to be published by Oxford. Could you provide more detail?